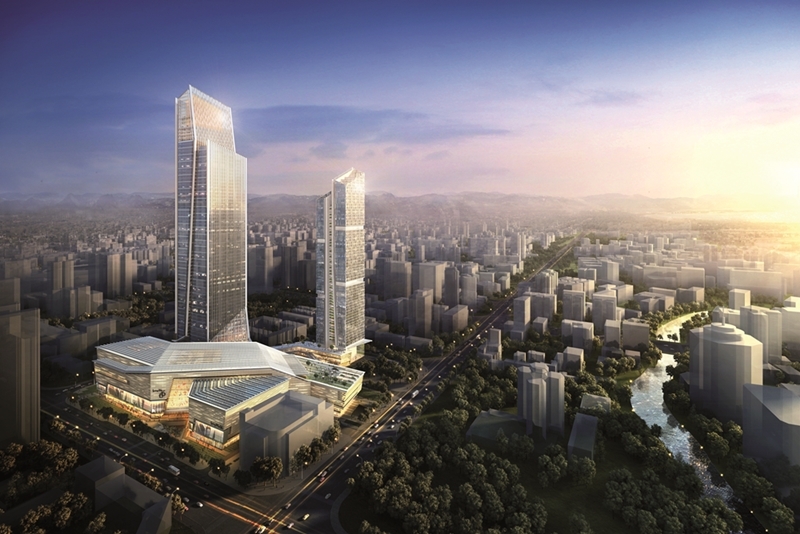 • Lighting	 Isometrix Lighting + Design, Ltd.
Spring City 66 is located in the heart of Kunming’s Panlong District, the financial and commercial hub of the city. 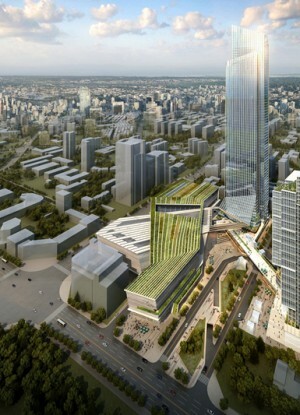 Its prime location enhances its function as the central core of the fast-growing downtown. Situated between two major thoroughfares, the building is in an ideal position to benefit from the huge amount of traffic that passes by every day. It will further centralize the city’s downtown core by integrating stations from two prominent metro lines, with commercial elements that will keep the area activated with users throughout the day, a necessity in any core building. The tower’s status as a centralizing agent is underscored by its commitment to a sustainable design that encourages continuous outdoor activity. 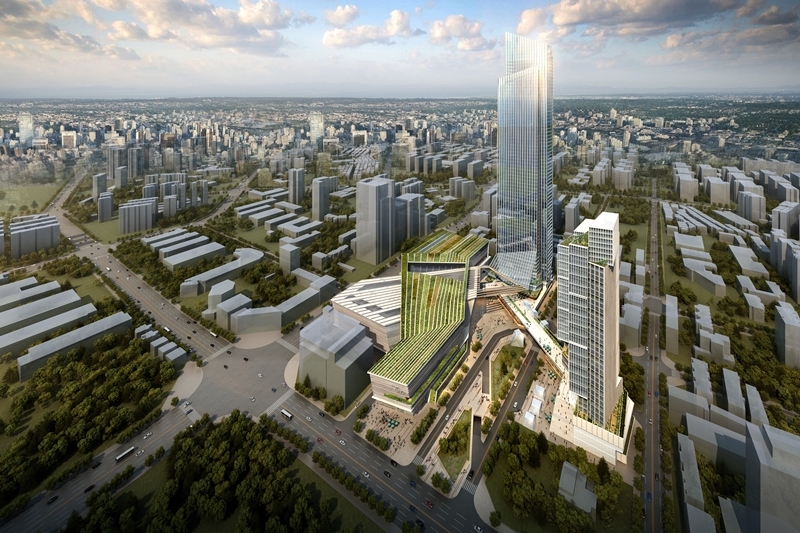 A broad promenade and multiple green areas are essential to the building’s design, and work to integrate the structure into the surrounding neighborhood by forming an unbroken expanse of greenery linking to the nearby Dongfang Plaza. This commitment to a high-degree of green spaces, along with other sustainable improvements, is intended to earn Spring City 66 a LEED Gold certification by the U.S. Green Building Council. The complex’s main tower rises from an abstractly shaped podium that tapers outward to create a hanging exterior. The tower, clad in glass, has vertical striping down its north and south façades that accentuates the building’s height. The structure narrows as it reaches the top; an angled parapet gives way to a gently tapered slope that culminates at the building’s highest point. 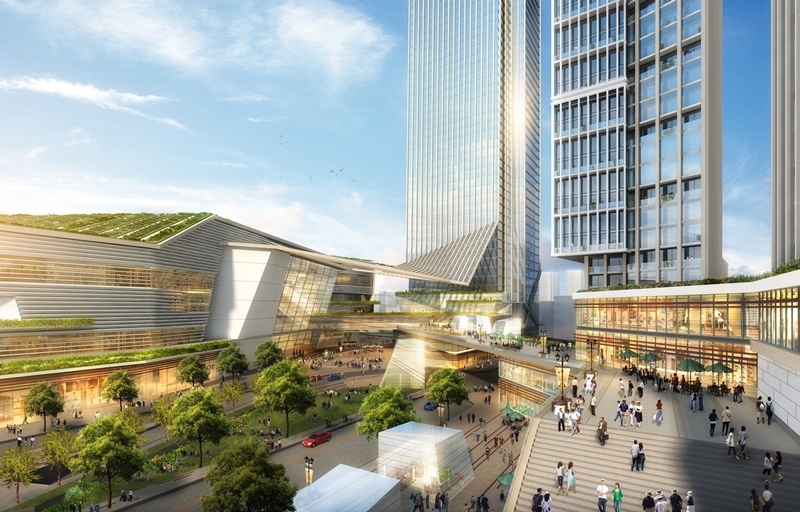 Spring City’s ambitious design allows the building to simultaneously act as a centralizing element for Kunming while also creating an iconic landmark for the city. In this way, Spring City 66 critically merges functional design with regional priorities.